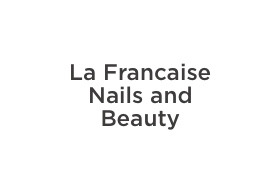 La Francaise Nails and Beauty offers the service you need for a tranquil and high quality manicure and pedicure experience. Get pampered in their cozy atmosphere or get the express service you need. Their skillful team provides a range of services including acrylic nails, shellac nails and waxing. Let them take care of you. Book today.